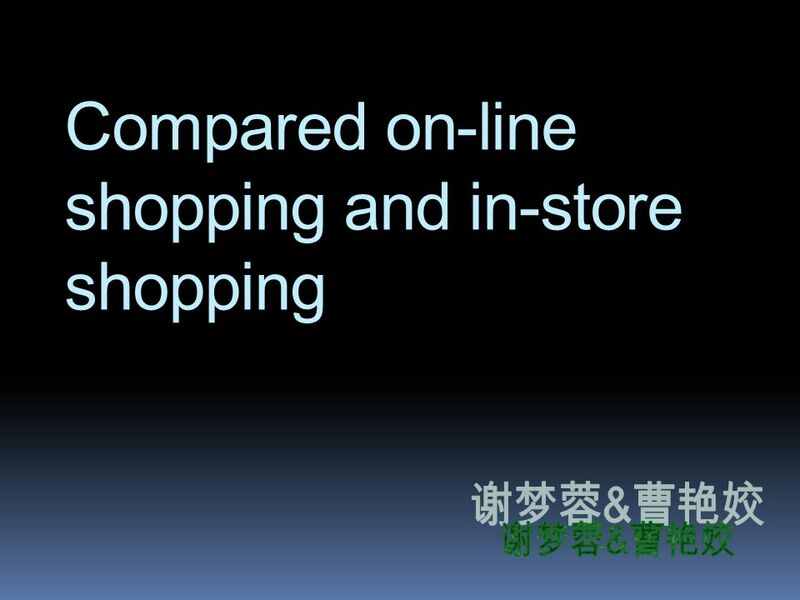 Compared on-line shopping and in-store shopping. T Minzy, your T-shirt looks so cool. Where did u get it ? T M I bought it online. T Really ? Do you often. 2 T Minzy, your T-shirt looks so cool. Where did u get it ? T M I bought it online. T Really ? Do you often shop online? M Yes. I buy most of my daily necessities online. T I ve never tried E-shopping. I do think shopping at an actual store is better. M What ? It s unbelievable. Shopping on internet, you can log in a website, browse through many items and categories comfortably at home, order the goods, pay by credit or debit card, and the goods will be delivered to your home, T Yes, you are right, it s really convenient. But don t overlook the disadvantage of online shopping. It s not so safe, some people have paid, but got nothing ; and it s likely to come across a hacker when shopping sometimes you maybe ripped off by the seller. 3 M Actually, It seldom happens like that. Now we have a good legal system to protect our consumers, and the website handles a point system where if the seller does something wrong, people comment negatively and then you know that he or she may not be trustworthy. 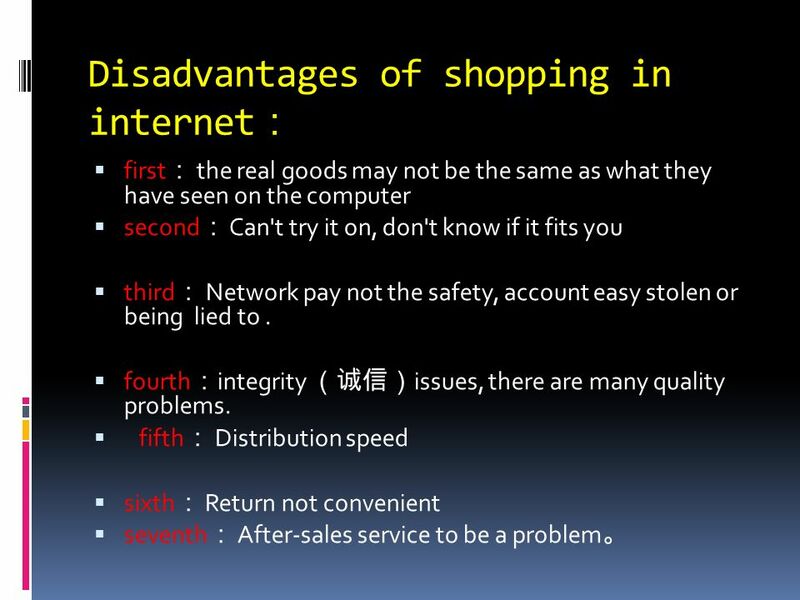 T Even so, I still worry about shopping on internet. 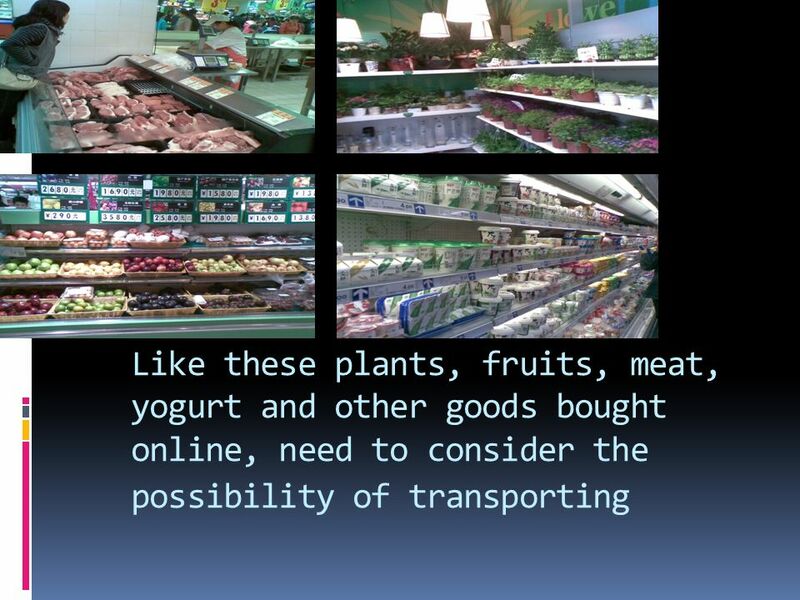 I think the market shopping is more secure, we can see the objects to make the right choice. M Hey, Tina, you have to change your mind. 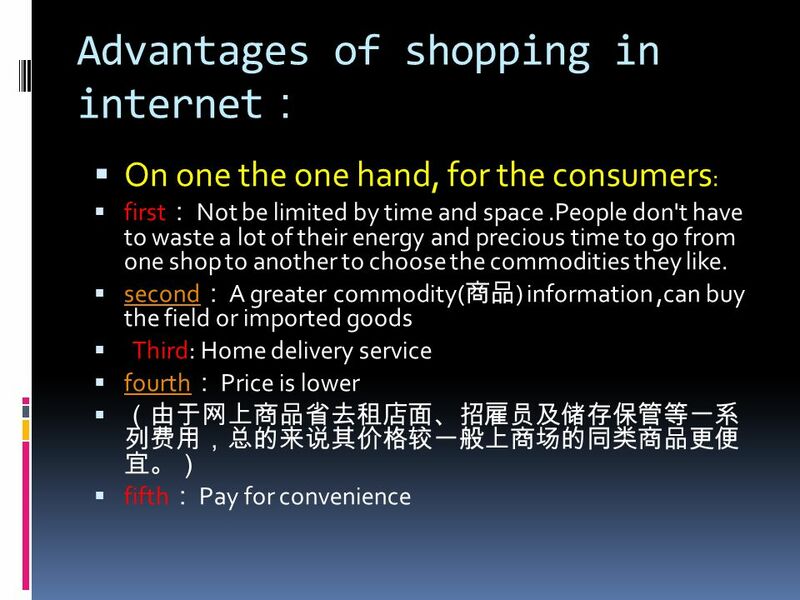 You know, there are many advantages for us to buy things on internet. Firstly, we have no time limit, we can buy a thing on the net at anytime, most of the shops are closed at 22:00 or even earlier, but the internet operates 24 hours a day, seven days a week, and can be accessed anywhere. 4 T Yeah, it s also the question. 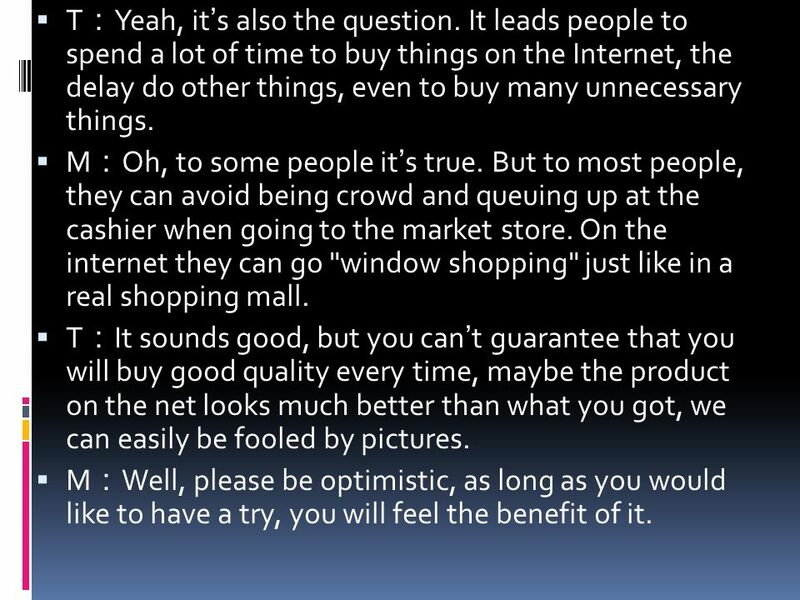 It leads people to spend a lot of time to buy things on the Internet, the delay do other things, even to buy many unnecessary things. M Oh, to some people it s true. But to most people, they can avoid being crowd and queuing up at the cashier when going to the market store. On the internet they can go "window shopping" just like in a real shopping mall. T It sounds good, but you can t guarantee that you will buy good quality every time, maybe the product on the net looks much better than what you got, we can easily be fooled by pictures. M Well, please be optimistic, as long as you would like to have a try, you will feel the benefit of it. 5 T Yes, maybe I should go with the flow. 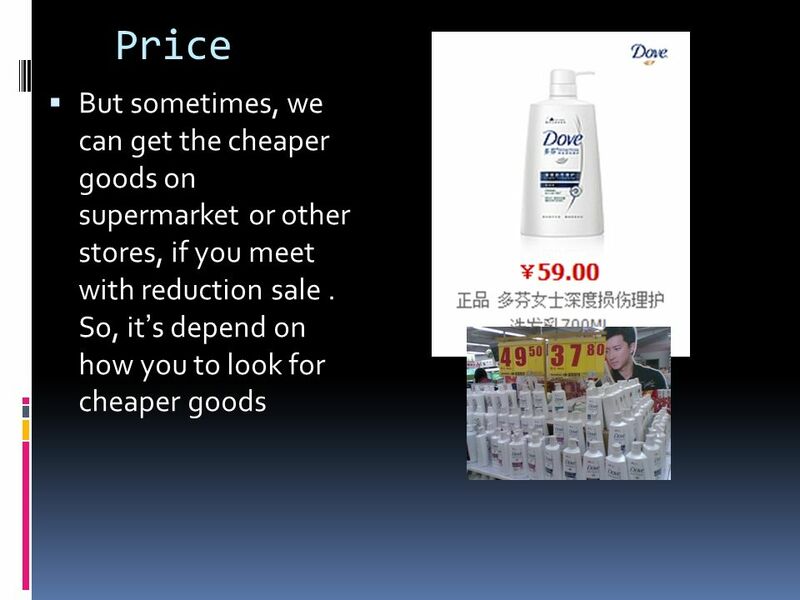 But we can t deny the advantages of the market shopping, at least it s more healthy, we can walk instead of sitting at home for shopping. M Sure! T I have to say shopping online will get more and more popular. It's a real revolution about people's consuming habits. M That s right. T Do you think I can find a sweater for my dog online? M You can find anything! 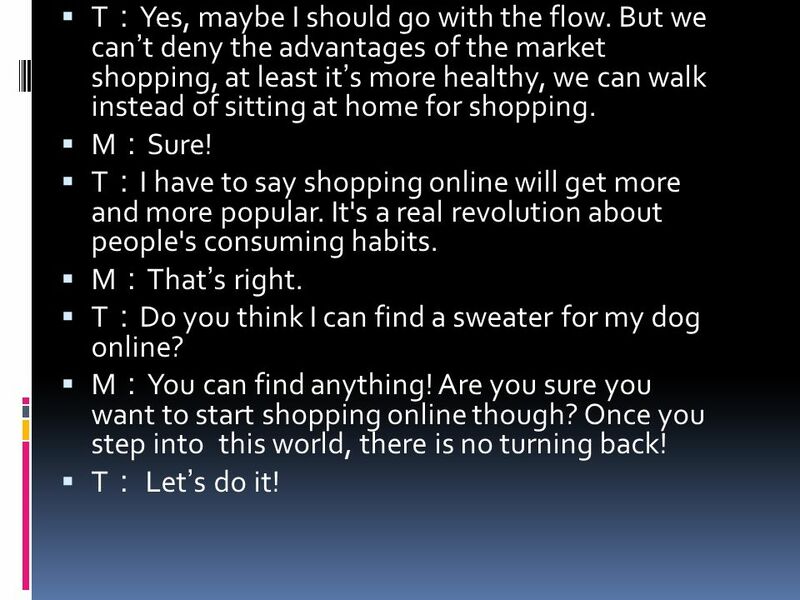 Are you sure you want to start shopping online though? Once you step into this world, there is no turning back! T Let s do it! 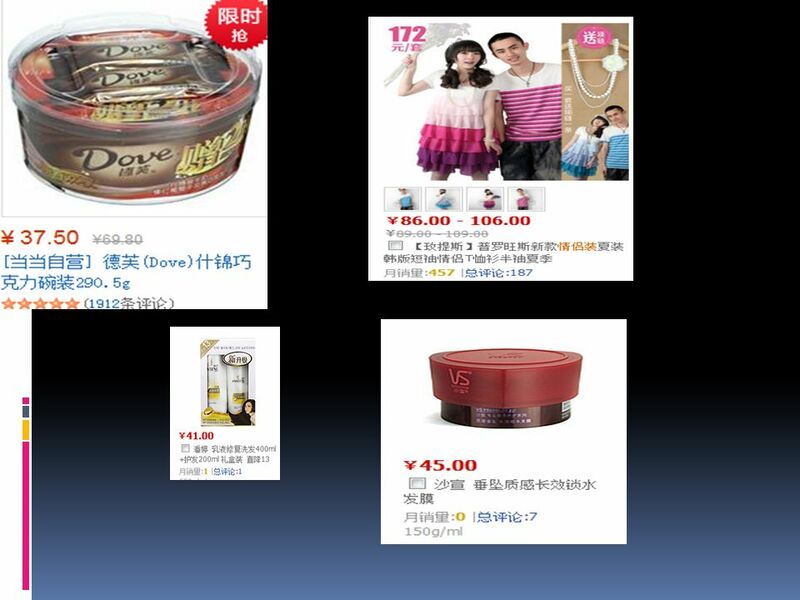 7 Price It is a fashionable and new way of shopping. 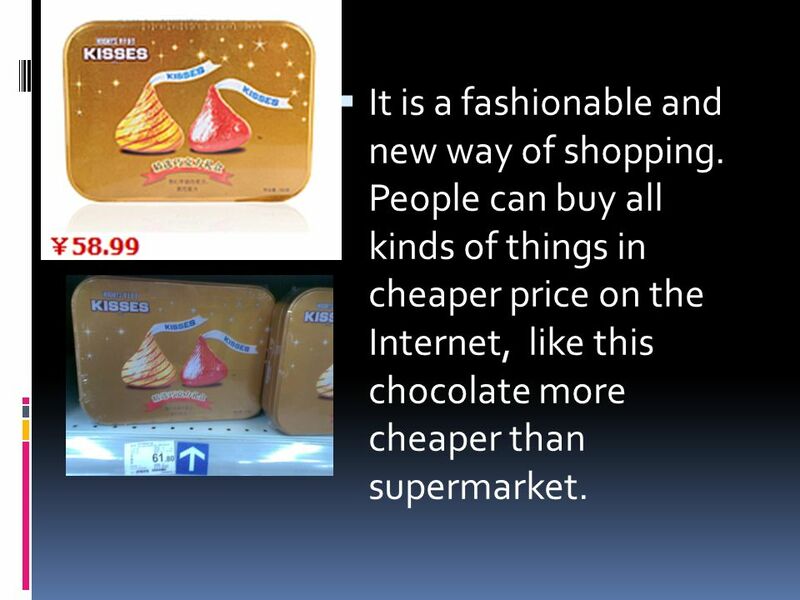 People can buy all kinds of things in cheaper price on the Internet, like this chocolate more cheaper than supermarket. 11 Quality People are easy to be cheated, because it is difficult to make sure the quality of goods. Undoubtedly, online shopping has brought us many conveniences. 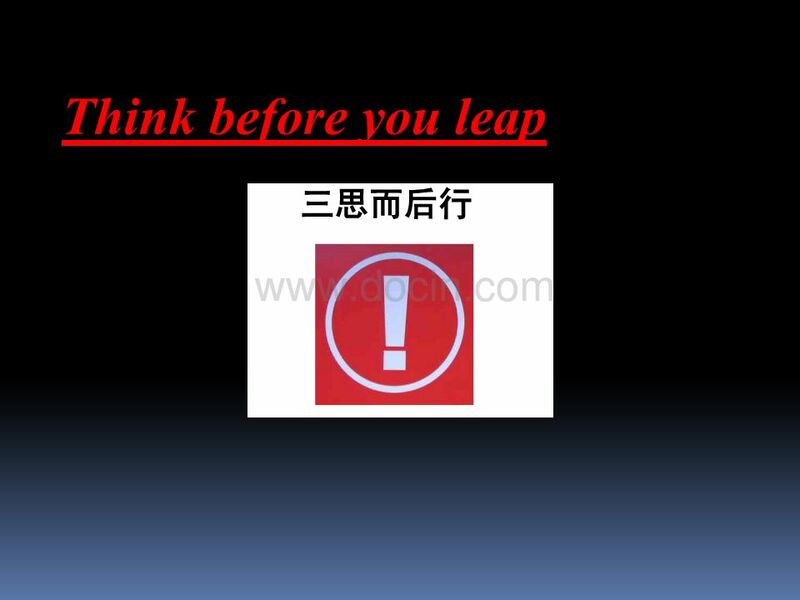 Yet its potential dangers to the consumer could not be ignored. One possible risk is that consumers might not get the exact product they want because the information provided might not be enough or reliable. 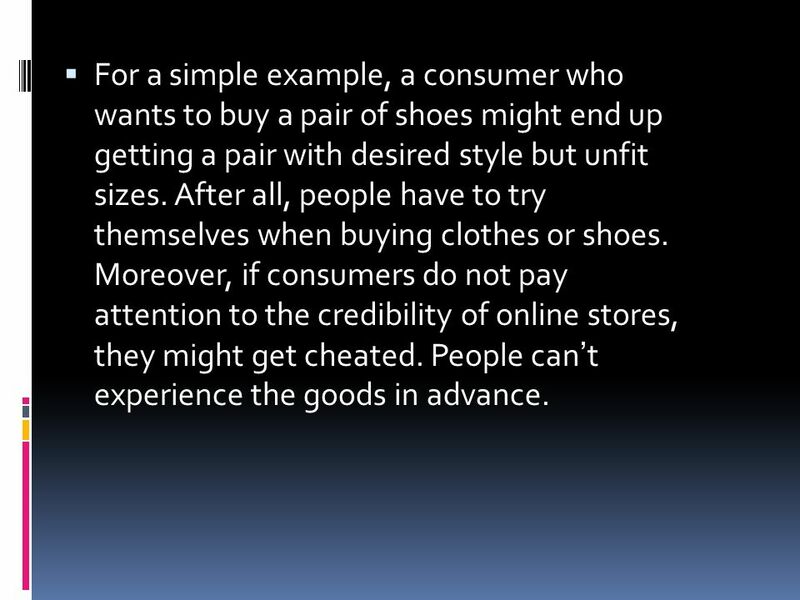 12 For a simple example, a consumer who wants to buy a pair of shoes might end up getting a pair with desired style but unfit sizes. After all, people have to try themselves when buying clothes or shoes. 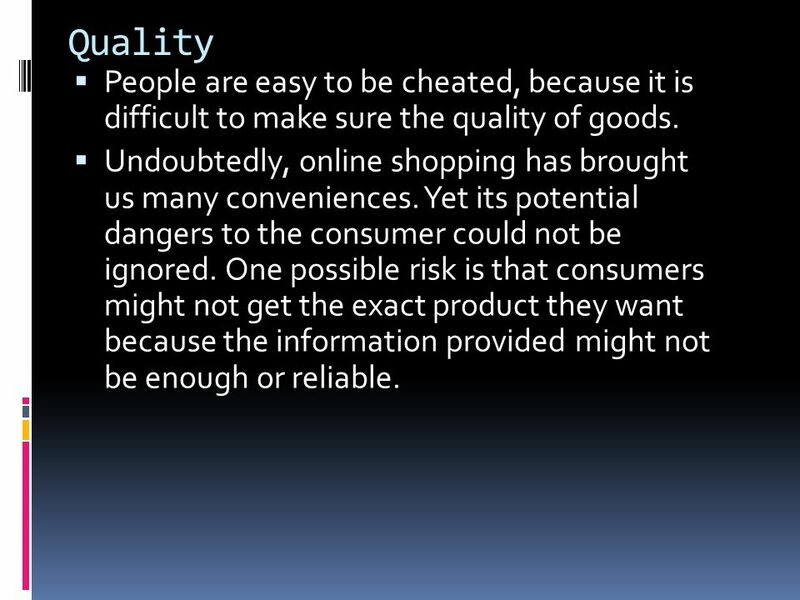 Moreover, if consumers do not pay attention to the credibility of online stores, they might get cheated. People can t experience the goods in advance. 13 Convenience Shopping online is more convenient, which you can finish without going out and it can help people to save much time. 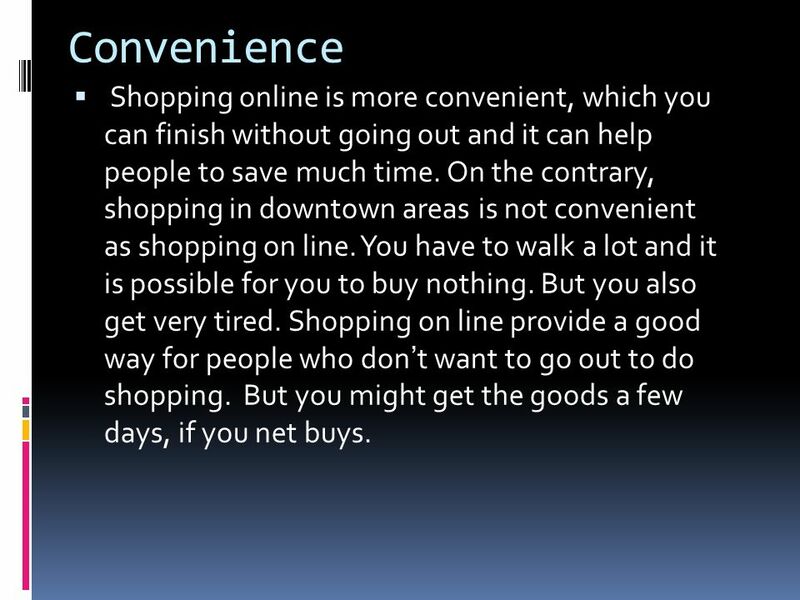 On the contrary, shopping in downtown areas is not convenient as shopping on line. You have to walk a lot and it is possible for you to buy nothing. But you also get very tired. 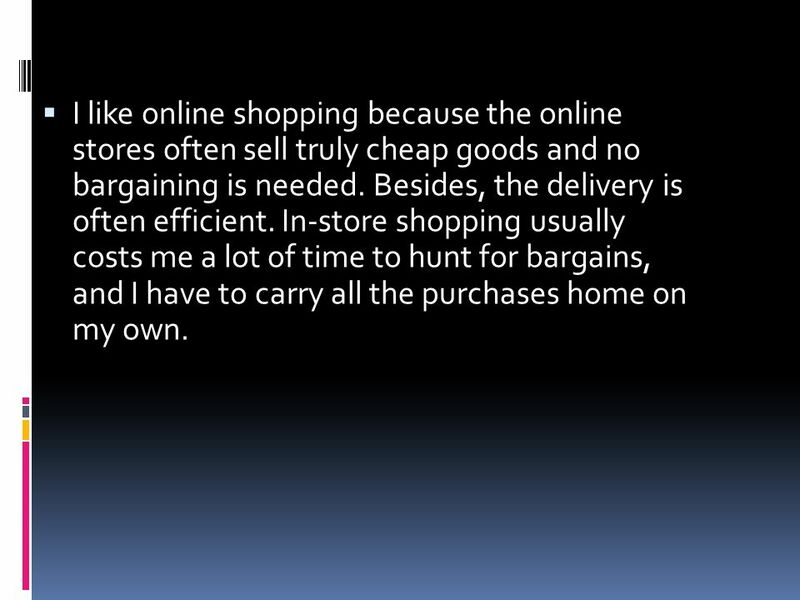 Shopping on line provide a good way for people who don t want to go out to do shopping. But you might get the goods a few days, if you net buys. 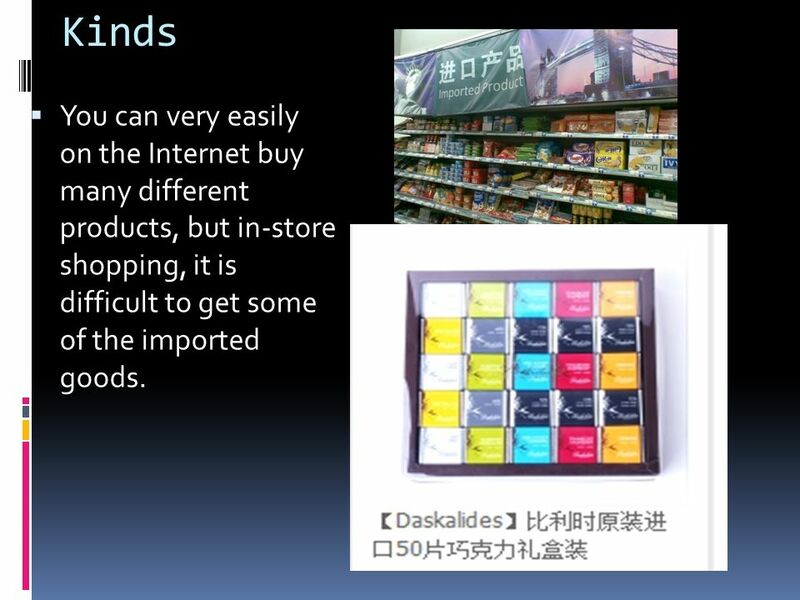 14 Kinds You can very easily on the Internet buy many different products, but in-store shopping, it is difficult to get some of the imported goods. 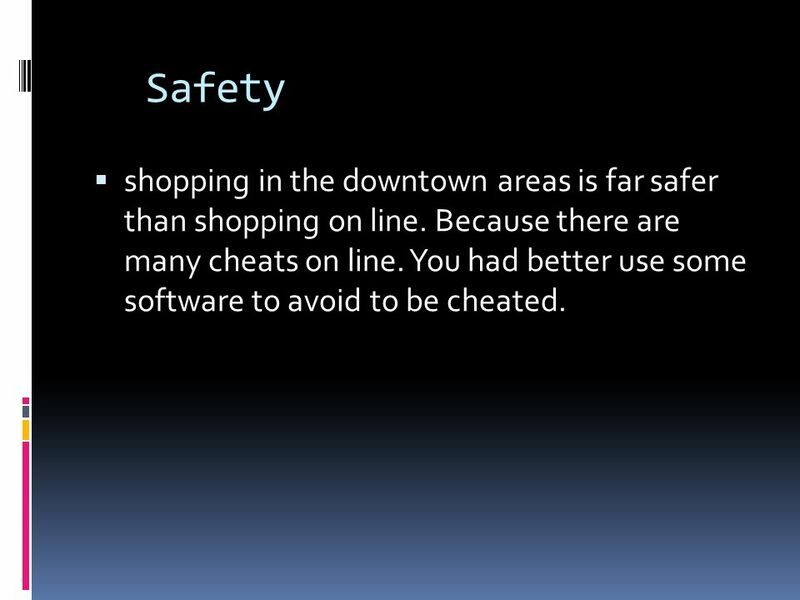 16 Safety shopping in the downtown areas is far safer than shopping on line. Because there are many cheats on line. You had better use some software to avoid to be cheated. 18 Personal feeling I like on-line shopping because it is efficient. It takes me little time, and yet I can buy nearly all the things I like. In-store shopping usually cost me more time. I like in-store shopping because it is personal, and I can have a good talk with the salespeople and make friends with more people. On-line shopping is just too mechanical and impersonal. 19 I like online shopping because the online stores often sell truly cheap goods and no bargaining is needed. Besides, the delivery is often efficient. In-store shopping usually costs me a lot of time to hunt for bargains, and I have to carry all the purchases home on my own. 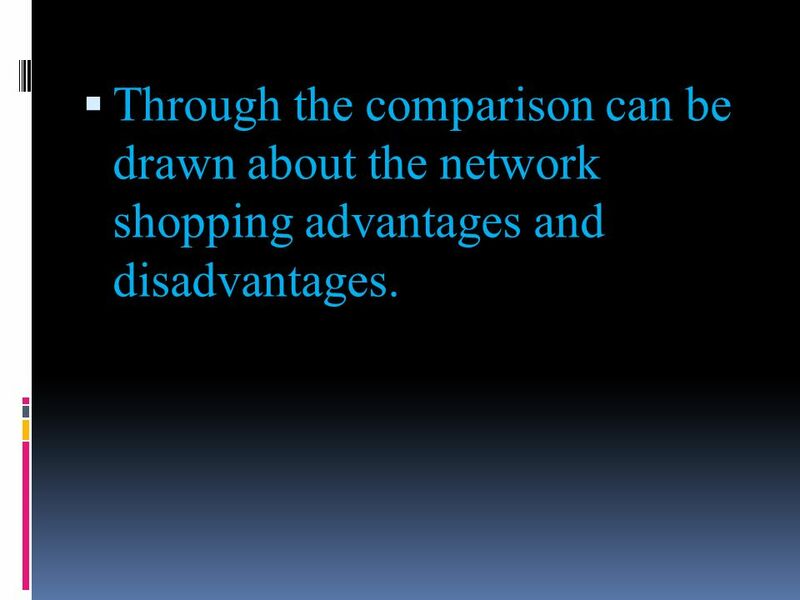 20 Through the comparison can be drawn about the network shopping advantages and disadvantages. 23 On the other hand, for businessman: There is not pressure of goods storage and not be limited by space. The businessman will earn more benefit. 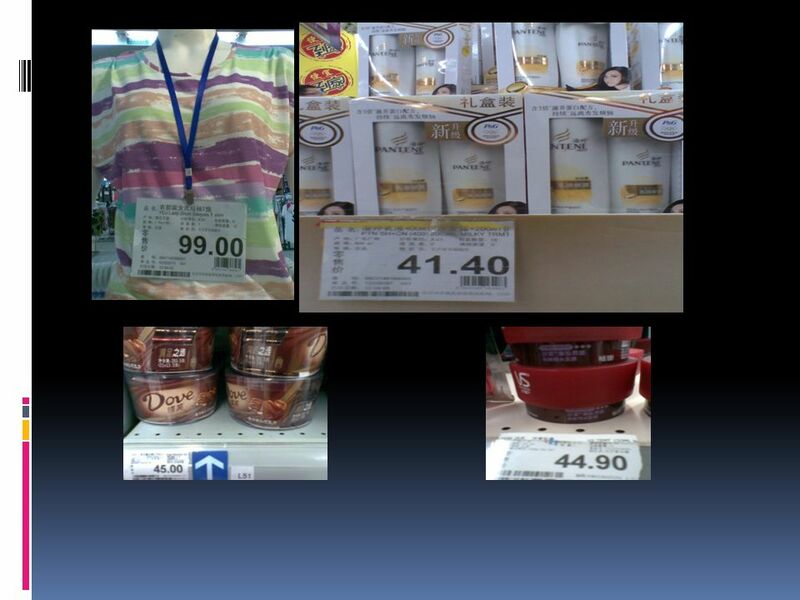 In the future, there will be more enterprises to choose the online sales. 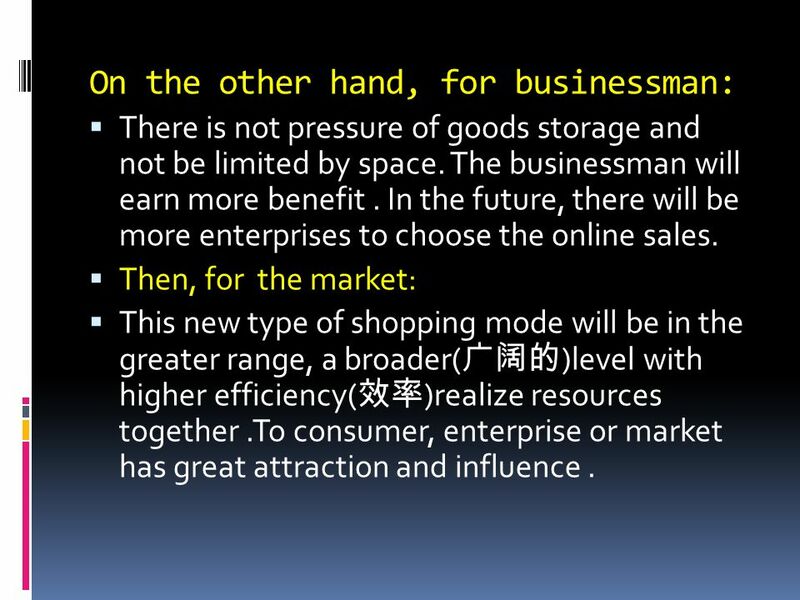 Then, for the market: This new type of shopping mode will be in the greater range, a broader( )level with higher efficiency( )realize resources together.To consumer, enterprise or market has great attraction and influence. 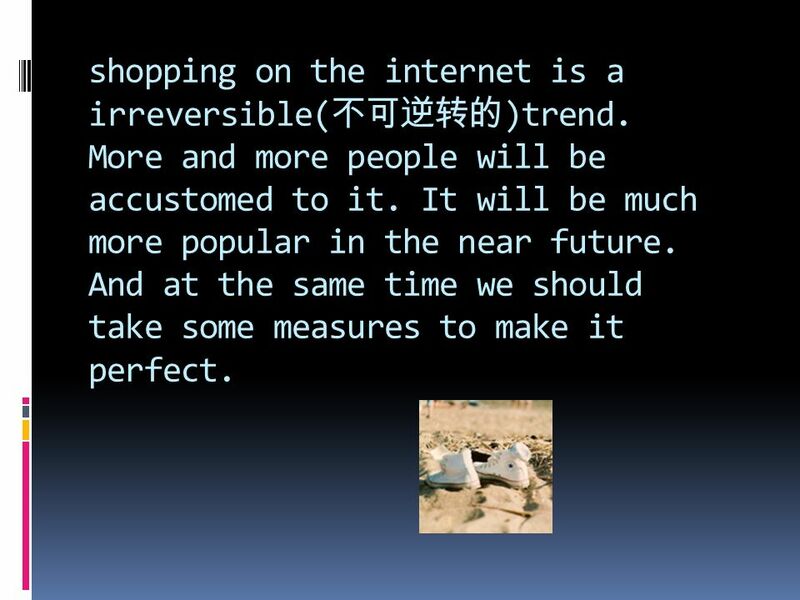 25 shopping on the internet is a irreversible( )trend. More and more people will be accustomed to it. It will be much more popular in the near future. And at the same time we should take some measures to make it perfect. 26 A: What are you doing? B: I m just looking for a nice pillow on E-bay. A: You are shopping for a pillow online? That s absurd! B: Why? I don t have to leave the house or browse a dozen stores to find what I m looking for. This way, I just search for it online quick and easy. A: I see, but how do you pay for it? How do you know you aren t going to be ripped off by the seller? 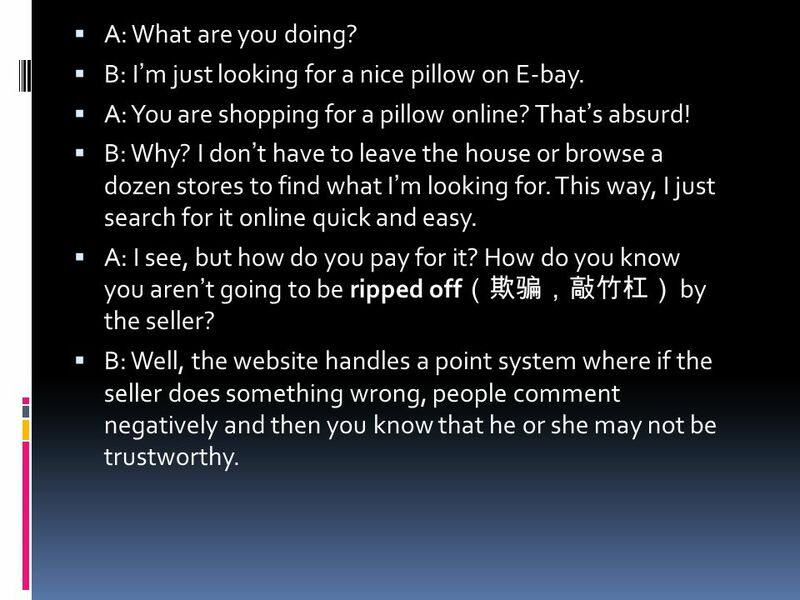 B: Well, the website handles a point system where if the seller does something wrong, people comment negatively and then you know that he or she may not be trustworthy. 27 A: Wow, that sounds pretty safe. So how do you pay? Do you need a credit card? B: You can use a credit card or your debit card. 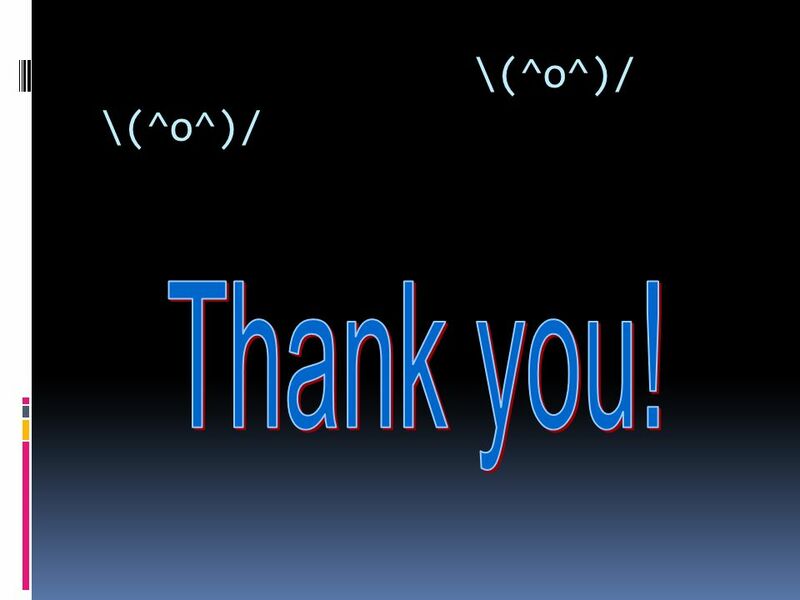 They also let you use the PayPal system which is really safe and fast. I have never had any problems with someone hacking my information or anything. A: Do you think I can find a sweater for my dog online? B: You can find anything! Are you sure you want to start shopping online though? Once you step into this world, there is no turning back! A: Let s do it! 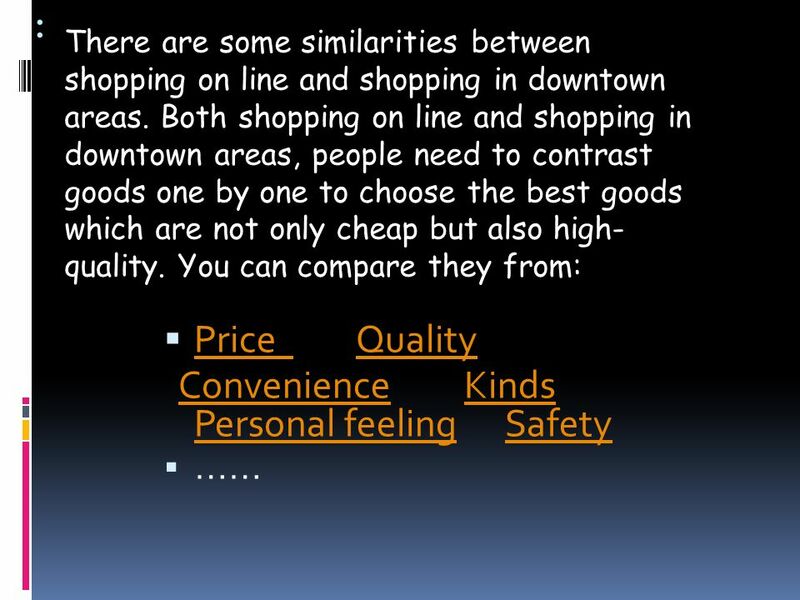 Download ppt "Compared on-line shopping and in-store shopping. T Minzy, your T-shirt looks so cool. Where did u get it ? T M I bought it online. T Really ? Do you often." Bellwork 1-1 Think of a purchase you made recently: –What was the name of the store? –Was the purchase made in the store or from home? –What type of store/company. FE B1 L12 Questions to Think The Internet. Warm-ups Look at the picture on p.181 and 183. What are they trying to tell us? The pictures are all about. Chapter 3 What is Money?. 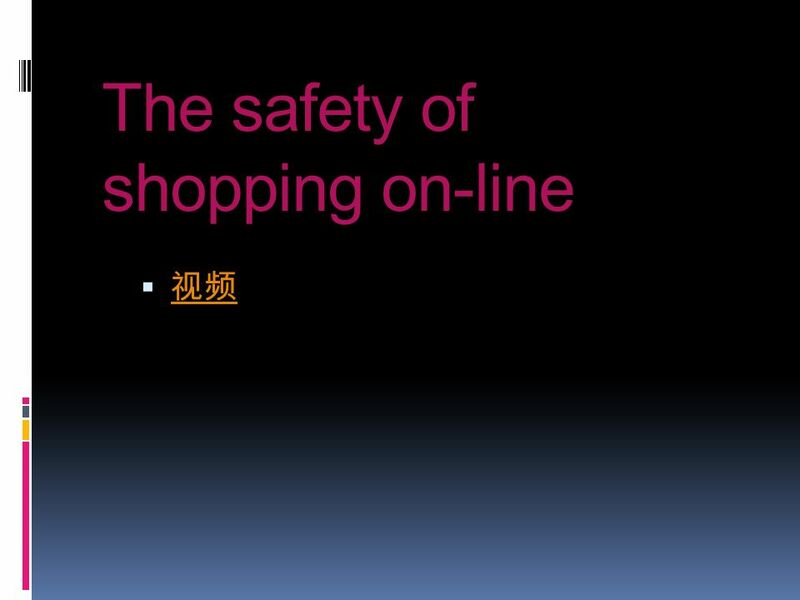 Online Holiday Shopping Brings Great Deals – and Fraud This lesson is part of the iKeepCurrent TM Program, provided by iKeepSafe TM. I would like to create this business to help out all of those young aspiring musicians wanting to learn bass guitar to have an opportunity to get an affordable. Solar Zone SunWare An E- Commerce Evaluation. Solar Zone Sunware Evaluation Of Product Navigability Evaluation Of Product Navigability –Are the paths. Why Buy Online? Selena Day. Statistics National Retail Federation by BIGResearch estimated that shoppers would do a quarter of their holiday shopping. E-Commerce Strategy By Callum Kirkman. Internet Safety and Kids Ms. Lee’s Classroom Computers are NOT bad Computers can be used to help kids learn and play. They can be used safely, if parents. WELCOME! Learn how to use Company Stores to Enhance your Business. Be able to plan e-commerce strategies. Hosting When setting up an e-commerce site, there are two issues of hosting which need to be decided - who will. Negotiating Zhejiang University of Finance & Economics Dong Fang College Toriano Cook.